Seriously, where is the best place in the US to shoot a deer? You’ve been checking your trail camera throughout the year hoping to spot that buck, but no luck. Yes, it might be that you’re on the wrong trail, hunting ground, or even the wrong state. Not every state has the same deer trophy potential, so it’s only natural to ask about where to shoot a deer in America this year. A great number of factors influence the quality of a hunting ground from knowing a species’ natural habitat, their current number, quality of deer, and likelihood of success on a hunt. You also have to consider the costs related factors such as a residential or non-resident license, average lease rates in the region, and your overall trip expenses. Then there are hunting stories in each state. It’s a tough one to crack, but not impossible, and finding it out is a big part of your deer hunting experience. So don’t let others guide you so much that they hold your hand. Take the trip on your own. Let’s start by understanding the species occupying North America. East of the Rocky Mountains you can find the white-tailed deer. It is the most widely-distributed and probably the most sought after deer in North America. Whitetail is a medium-sized deer, with a reddish-brown coat (spring and summer) and grey-brown coat (fall and winter) and a characteristic white underside to its tail. West of the Rockies, the mule deer is the dominant deer species, with the Blacktail deer group spread along the west coast (west of the Cascade Range) from Northern California to Southeast Alaska. The most noticeable differences between whitetails and mule deer are the overall body size, the size of their ears, the color of their tails, and the configuration of their antlers. Axis deer occupy Hawaiian islands, especially on the islands of Lanai and Maui, ever since they were introduced to the environment in 1950s. They are golden to rufous, completely covered in white spots on abdomen, rump, throat, insides of legs, ears, and tail all being white. It’s somewhere in between the previous two when talking about the size of their bodies. Finally, in Canada and Alaska, reindeer (caribou) is the widest spread species. 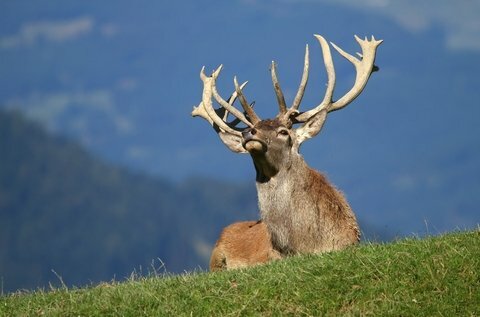 Being the biggest of them all in body size, it’s often considered big game, together with Moose and elk, even though they all are technically species of deer. Deer hunting seasons vary across the United States, because each and every state, in its own right, and by their own DFW (Department of Fish and Wildlife), regulate the duration of the season based on the health and population of the deer, and the number of expected hunters. As you know, before you go deer hunting, you must have a proper license. That also varies from state to state. Once you decide on a deer hunting ground be sure to check the state’s DFW for season duration, licence required, paperwork, and price for residents and non-residents. After preparing yourself, consider calling the local office of the U.S. Fish and Wildlife Service and/or state Wildlife Resources Commission, letting them know that you’re a first-time deer hunter interested in what they have to offer and need help in selecting the right hunting areas. By now, you should have narrowed your choice. Time to get to know the chosen hunting ground. Get yourself a topographic quadrangle map of the region and inspect it first hand. Do some scouting and cam trailing no matter if it is a current hunting season or not (remember to wear blaze orange all times just in case). However boring this may sound, planning your hunt ahead is what raises the odds of your success. Finding out where to hunt deer is just the beginning of your deer hunting experience. It’s a trip you should eagerly look forward to, not wait to be lead into by the hand. If you do it all by yourself, that trophy you’ve been missing, once caught, will have even greater value, and you’ll have a great tale to tell.